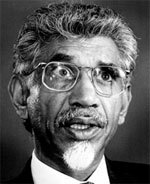 Mac Maharaj was born on the 22 April 1935, the fourth of the eight children of Mr and Mrs NR Maharaj of Newcastle, Natal. He matriculated at St Oswald's School and enrolled for a BA degree at the University of Natal, Durban, as a part time student. Whilst at university, Maharaj served on the Students' Representative Council, campaigned against the segregation of students and supported the boycott of the separate graduation ceremonies held at the time. In addition he edited the students newspaper, Student Call, from1955-56. Maharaj completed his BA in 1955. In 1956 the 'Non-European' section of the university opened an LLB faculty where he completed his first year. However, the faculty closed down in 1957. Following the arrests of Congress leaders for the 1956 treason trial, Maharaj was asked to take over the running of the New Age newspaper. He decided to leave for the United Kingdom in August 1957, as he was unable to obtain a permit to study law in the Cape or Transvaal. In 1959 he became a part-time student at the London School of Economics where he began his LLB again. In 1960, following the Sharpeville massacre, the Congress movement asked him to return to South Africa and devote himself more fully to political work. He returned on 2 May 1962 with his first wife, Ompragash. Maharaj worked for a firm of attorneys in Johannesburg whilst spending a great deal of his time on political matters. In July 1964, he was arrested in Johannesburg, charged and convicted with four others on charges of sabotage in what became known as the Little Rivonia trial. Maharaj was sentenced to 12 years' imprisonment, which he served on Robben Island. Whilst in prison, he completed a B.Admin, an MBA and the second year of a B.Sc degree before his release on 8 December 1976. On his release, Maharaj was served with a five-year banning order prohibiting him from leaving his Merebank, Durban, home at night. His wife had left the country in 1974 on an exit permit and was living in London. Maharaj was refused permission to take up employment in central Durban and could therefore not earn a living. Following instructions from the ANC, he left South Africa in July 1977 and was deployed by the organisation in Lusaka. A senior official in the political department of the ANC, Maharaj was elected to its national executive committee at the 1985 Kabwe Conference. From 1987 to 1990, Maharaj worked underground within South Africa, as part of Operation Vula. Following the unbanning of the ANC and the South African Communist Party, he had to leave the country and re-enter legally under an indemnity from prosecution, agreed to between the ANC and the government. On his return, he assisted in the organisation and restructuring of the SACP. He appeared at a press conference with then-SACP general secretary Joe Slovo when it was announced that the party would be relaunching as a legal body in July 1990. At this launch, held on 29 July 1990, it was announced that Maharaj was a member of the SACP's central committee, and he was also named as a member of the party's 22-person interim leadership group. On 26 July 1990, just three days before the launch of the Party, security police detained Maharaj in Johannesburg under section 29 of the Internal Security Act, following police allegations of an ANC/SACP/ Umkhonto we Sizwe plan (codenamed Operation Vula) to seize power in the event of the failure of the ANC negotiations with the government. Initially charged under the Arms and Ammunition Act, additional charges were later added. In October 1990, Maharaj and eight others were charged with terrorism and, alternatively, illegal possession of arms, ammunition and explosives. It was alleged that they had conspired to create a national underground network to recruit, train, arm and lead a 'people's army' or 'revolutionary army' to seize power from the government by means of an armed insurrection. The accused were released in November 1990 on bail, and all charges dropped on 25 March 1991 after the accused received partial indemnity with respect to Operation Vula. In 1990, Maharaj announced his retirement from the central committee of the ANC. At the ANC's national congress held in Durban during July 1991, Maharaj became a member of the secretariat of the Convention for a Democratic South Africa (Codesa), which brought together most South African political organisations to negotiate a new constitution dispensation. After the 1994 elections Maharaj was appointed to the cabinet where he served as Minister of Transport until the 1999 elections. Maharaj resigned from active politics in 1999 and is now active in the business world.